"Sweater weather" has become more of a mindset than a fall trope. Oversized turtleneck sweaters, bold striped sweaters, cropped cuts - a statement sweater isn't a trend, it's a necessity. 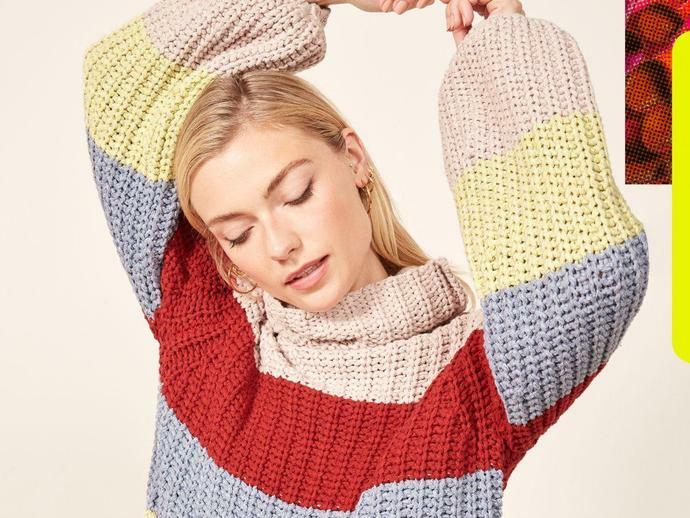 So hearing that two of our favorite female-founded brands have teamed up for a special sweater collaboration has us finally ridding our closets of the last lingering summer pieces to make some much-needed room. The La Ligne x Reformation sustainable knitwear collection is a meeting of minds touting Reformation 's eco-friendly practices with La Ligne 's legacy in knitwear. The collection, which manifested itself after Reformation's CEO Yael Aflalo and La Ligne's co-founder and CEO Molly Howard found themselves on a panel together, came together quickly after the two discovered their brands' similar core values. With two loyal audiences to bring to the table, a cozy collaboration seemed almost inevitable. Aflalo shares that, throughout the collaborative process, she loved "working with La Ligne to combine our design sensibilities and create something that represents both brands." Fans of the two labels will easily be able to pinpoint where one brand ends and the other begins. The sweaters' aesthetic and design stay true to La Ligne (its iconic stripes make a requisite appearance), but the silhouettes are pure Ref. Valerie Macaulay, creative director and co-founder of La Ligne, shares, "The styles we created for this collaboration are classic La Ligne, but translated into Reformation girl silhouettes. They're slightly more cropped, include feminine sleeves, and are perfect to throw on for a fall day." Another Reformation touch? The sustainable manufacturing practices put in place for the collab. For example, the 'Sail Away with Me' sweaters are made from up-cycled denim yarn - yes, denim - which Aflalo explains is "obtained from recycling used denim cuts that are then reduced into fibers, spun and transformed into super comfy sweaters." And the fibers themselves are safe considering they aren't dyed and contain no added chemicals. The sustainable learning curve for La Ligne was a true hands-on experience. Howard says: "It was an honor to work with and learn from Yael and the Reformation team. Reformation is a true leader in the sustainable fashion space...We worked hand-in-hand to source and produce the garments, learning about the research, work, and dedication it takes to create truly sustainable clothing." With La Ligne's extensive background in sweater design, we wanted to know what exactly made the three final styles so special. Meredith Melling, chief brand officer and co-founder of La Ligne, shares: "We design for strong women who are on the go. We make clothes you can eat, drink, and dance in! From the fun, bright colors on the ' Color Me Happy' sweater to the classic cable knit fabrication of the ' Sail Away with Me' style, there's really something for everyone." Sleep on fall no longer and be the first to see and shop the cozy sweater collection with our exclusive look ahead.